Aluguer Four Season: Uma casa de férias acolhedor, rodeado por uma área de casas majestosas e propriedades inigualáveis. Aproveite esta casa, suas vistas e arredores. Caminhe até a Equinox Mountain para fazer uma caminhada ou vá até a vizinha Hildene. Apenas alguns minutos para o centro e campos de golfe excepcionais. Você tem esqui, o horseshow verão, pesca, ténis, natação, spas, restaurantes, lojas, eventos culturais e galerias, todos a poucos minutos da casa. Experimente este recentemente renovado celeiro lindamente decorado com o charme do velho mundo e amenidades modernas em 3 acres Taconic Road. Esta casa aberta e espaçosa apresenta vigas expostas, madeira velho celeiro, piso original de tábuas largas, artesanato único, uma nova suíte master com piso aquecido ao longo, uma banheira de mármore, closet e pátio privado. Aproveite a abertura da cozinha atualizado para o lr / dr / deck / bar molhado / den, ou sentar e ler na área de estar no andar de cima recém-renovado. Abrangendo 2350 pés quadrados, a casa é completa com 5 + quartos, 3. 5 banheiros, uma lareira a lenha, três garagens de carro, casa de hóspedes separada, equipada com uma casa de banho completa e decks recentemente renovados, rodeados por linda bem cuidada jardins. Enquanto você relaxa no deck, equipado com uma nova churrasqueira a gás, cadeiras adirondack e mesa de jantar ao ar livre, você tem vista para o lago alimentado por córrego, belas vistas para a montanha e gramado paisagístico, forrado com bétulas maduras e macieiras. Tudo isso e minutos para um mundo de deserto, entretenimento e restaurantes finos. Oferecido semanal ou mensal durante todo o ano. As taxas semanais variam de 3000 a 4000 p / sem as utilidades. um imposto de 10% Vt e uma conta de limpeza única não estão incluídos. Nightly taxa de aluguel é de US $ 600-800 / night, dependendo da época. Harley House was ideally suited to our family wedding weekend in Manchester. And we were there during the spell of 95 degree heat.....and were perfectly comfortable. THANK YOU MARK. Beautifully appointed and awesome location! A very beautifully appointed home - owner exceedingly responsive to our questions and the location was perfect for our get-away. Views of the green mountains but so close to Manchester center (and great shops - don't miss the Vermont Butcher Shop for your grilling meats and bacon, they are awesome!). Fire pit outside was well used for the late Spring evenings! We loved our stay, thank you Mark! My family was very happy at this property for our winter ski getaway. Location was perfect for our desire to ski a few different mountains and use this as home base. The house was very well appointed, the kitchen appliances are great! Loved the rustic look and feel. Mark was extremely responsive to emails and inquiries and responded very quickly. I would definitely recommend this house and owner. I hope to be able to stay here again at some point in the future. Thank you, Lisa!!! You guys were the perfect guests and I truly appreciate how well you looked after the house and how easy you were to work with! We are beginning a big renovation of the main level (new floors throughout, opening up the space a bit) and downstairs area (adding bathroom and opening up the bedroom area) next month so we look forward to welcoming you back the next time you are coming to Manchester and can't wait to hear your thoughts on the improvements! 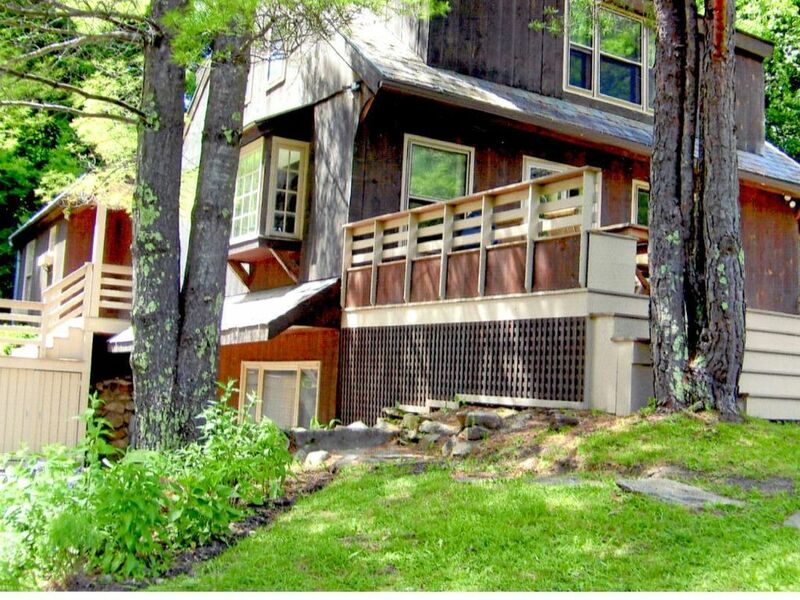 We rented Harley House for the ski season last winter and we'll be renting it again this winter. (The ultimate endorsement, no?) It truly is a special home, offering Vermont charm with a clean and contemporary look and feel. The owner, Mark, has proven to be the best "landlord" we've ever dealt with. He cares deeply for the property and it shows in how he's maintained it. Our only regret is that we haven't yet experienced the place in warm weather. With its large porch and beautiful sprawling lawn, it would make for some really fantastic cocktail hours during the summer. I recently stayed at Harley House for a week during the Vermont Summer Festival horse show. The house was beautiful, and ideally located just around the corner from the Equinoxx Hotel which is an amazing location for dinner or a drink. The house was a relaxing getaway after spending long hours at the horse show. The owner of the house was also very easy to work with and accommodating.